This is the first article in a new format; when we consider a subject is important enough to warrant detailed comment we will break the post into two. Part 1 will go straight for the jugular and you should be able to read it in less than a minute, Part 2 will contain more detail, should you wish to explore the subject further. Google is going to cripple some businesses, and it won't be Google's fault. We are not exaggerating, and the blame will lie fairly and squarely at the door of each failing business's managers. All because their business will look poor by comparison with its direct competitors in every Google search. Google wants businesses to encourage their customers to write reviews. 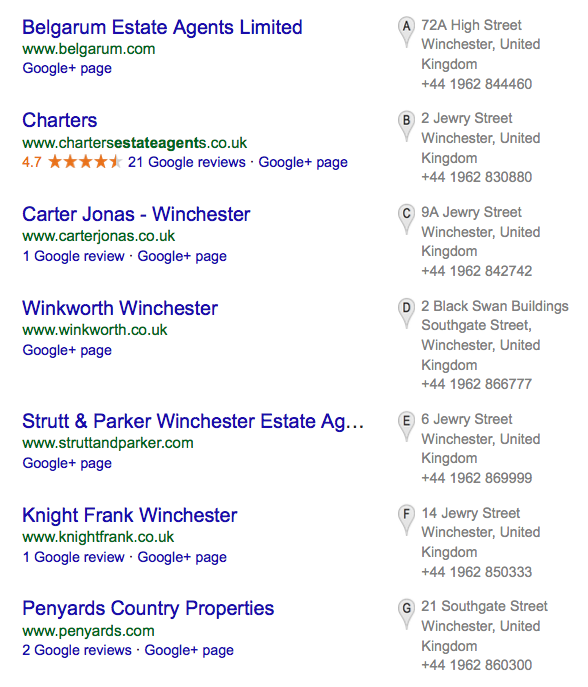 Why does Google want those reviews (and give them such prominence)? Because it knows - for certain - that its users (your potential customers) want them. One business is giving Google (and its potential clients) what it (and they) want. Just one business. Do some business people seriously think that today, in 2015, consumers are not influenced by what they see on Google? The figure on the right is the number of times the information contained in the page has been shown in searches. What information? The business's name, address and phone number and any reviews. While three out of the four reviews for the other businesses are similar 'one stars', one is a glowing 'five stars'. Written five years ago, did it not occur to that business to ask some more of their customers to post a review? One answer has to be that businesses are afraid to ask their customers to review them in case the review is negative. Well, Dialogue solves that one - it helps you 'manage out the fear'. Now let's get the reviews in!